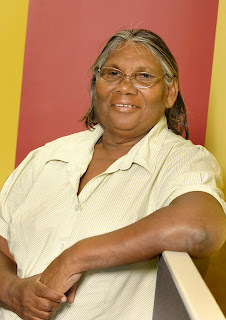 Mrs Doris Eaton, Aboriginal Elder and YMAC’s Co-Chairperson was announced Female Elder of the Year at Friday night’s NAIDOC Awards in Brisbane. Mrs Eaton was recognised for her cultural leadership and work with Aboriginal communities in the Pilbara. On receiving the award, she sais her driving force is to make sure younger generations learn strong culture from their Elders. “Preserving culture is important to make sure the next generation has a sense of identity. Elders need to teach the youth their language, dreaming stories and cultural practices. First learn your own culture and then you can be strong enough to move between the two worlds, to marry Aboriginal and mainstream cultures together.